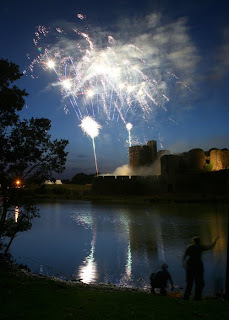 The Kat's Scratch Pad: Caerphilly Cheese Festival 2010 - Fireworks! On the last weekend in July, Caerphilly holds it's annual "Big Cheese" event which you really can't miss if you are in the area! Attracting over 70,000 people last year, families flock from all over the country to enjoy the fun that the festival has to offer. There's the funfair, reenactment displays, craft stalls selling all manner of goodies, falconry, music tents pumping out offerings from the local bands, food & drink marquees where Welsh producers gather to sell more delicious food than you can eat in a lifetime - "cakes, wine, liquers, sweets, chocolate, cheese, pickles and much more"; and of course....BEER! 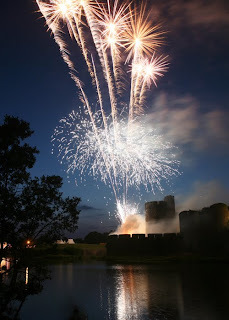 However; with all that on offer, my favourite will remain the fireworks display on the opening night. 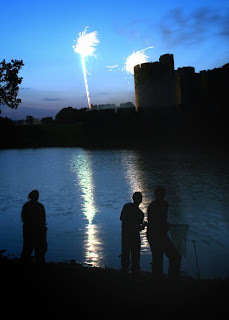 Fireworks are pure magic and I'll never tire of them! 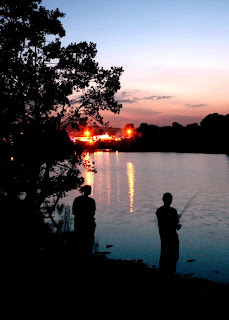 So without further ado, here are my photographic offerings for this year, made all the more entertaining by the fisher-folk who not only became my unintentional models for the evening, but also roped Rob into helping them land a monster carp! 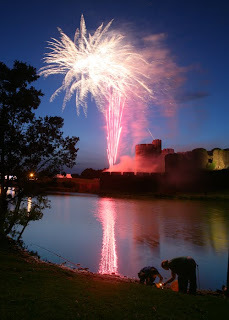 I'm very happy indeed with the results and once again, a superb display by the fireworks team - Bravo! !